Hey guys, so I have decided to add another segment to this blog. Actually a lot of segments will be added as time goes by, so watch out for that. Today, It’s going to be ‘PICTURE OF THE DAY’. This is where a picture of a landmark, tourist site, building, food or anything interesting relating to tourism is taken and put up here. Fun facts, tidbits or a little story about what is in the picture will also be shared along with it. So on to our first picture of the day. The National Arts Theatre is one of my favourite architectural buildings in this country. I mean just look at it, quite iconic. It is located in Iganmu, Lagos State. I took the picture while I was on Eko Bridge hence the bridge rails. 1. 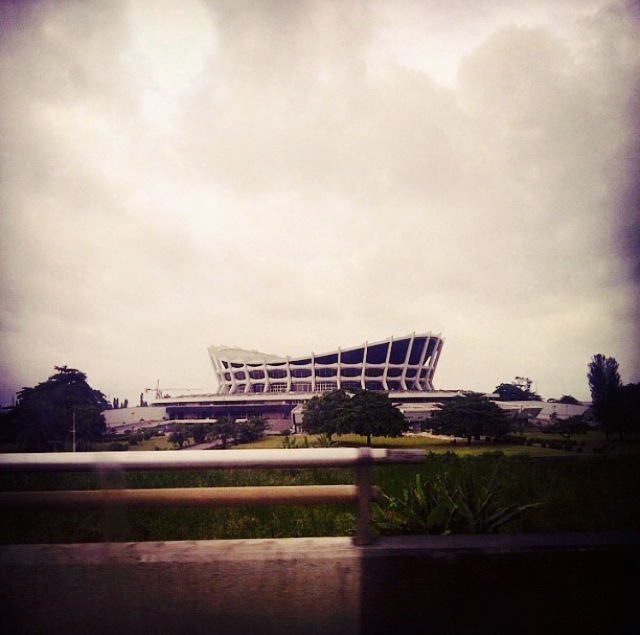 It was officially opened in September 1977 by the former head of state, Gen Olusegun Obasanjo. This was five months before the second Festival of Arts and Culture (FESTAC), which was hosted by us (Nigeria). 2. Speaking of architecture, its construction is in the shape of a military hat. Bet you never noticed that. It was designed and constructed by a Bulgarian construction company. This is probably why it has a resemblance to their sports hall in Varna, Bulgaria. 4. It was originally established to promote, present & preserve available arts & culture in the country. 5. It has a main hall which apparently has the capacity of seating 5000 people, 2 cinema halls, a conference/banquet hall, an exhibition hall, and a VIP lounge and a roof garden. You can check out their website, although there’s not a lot on there. Maybe its still being updated? I have no idea if it’s still being used for what it was originally constructed for. If it isn’t that would be a shame and I would hope plans are being put in place to bring it back to its former glory. Of course I plan on going there soon, then I’ll be able to bring you a tourists point of view of what is going on in there. It is an untapped goldmine in my opinion. Have you ever been inside? What are your opinions on it? p.s If you have any pictures to share for this section, get in touch. Like I always say, speak your piece in the comments section. Previous Previous post: How conservative are you?